Final Stages of Construction of Chabad House After 48 months of construction, the Chabad House at Rutgers University has opened its doors. See and celebrate the opening of a 90,000 square foot center of Torah, Outreach, education, housing, kosher dining, and much more on the Rutgers campus. 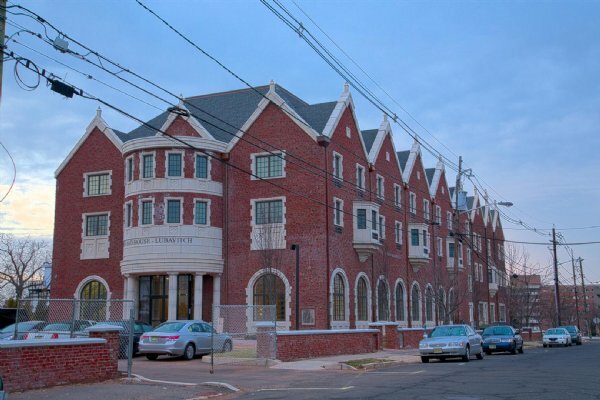 Situated in the heart of Rutgers, the magnificent mega-Chabad House features housing for 107 students, kosher dining-hall for 770 students, 8,000 sq ft of kitchen and food preparation, gyms, lounges, classrooms, and multi-purpose rooms. The $20 million dollar complex is the largest Jewish center on any public university campus, and serves as headquarters for all Chabad activities in central and south New Jersey. See the interior views of the lavish ballroom and Kosher Dining Hall that accommodates 770 students. Visit the new dormitory wings that can house 107 students, complete with lounges and exercise gyms. For further information, or to arrange for a personal tour, please call Chabad House at 732-296-1800.